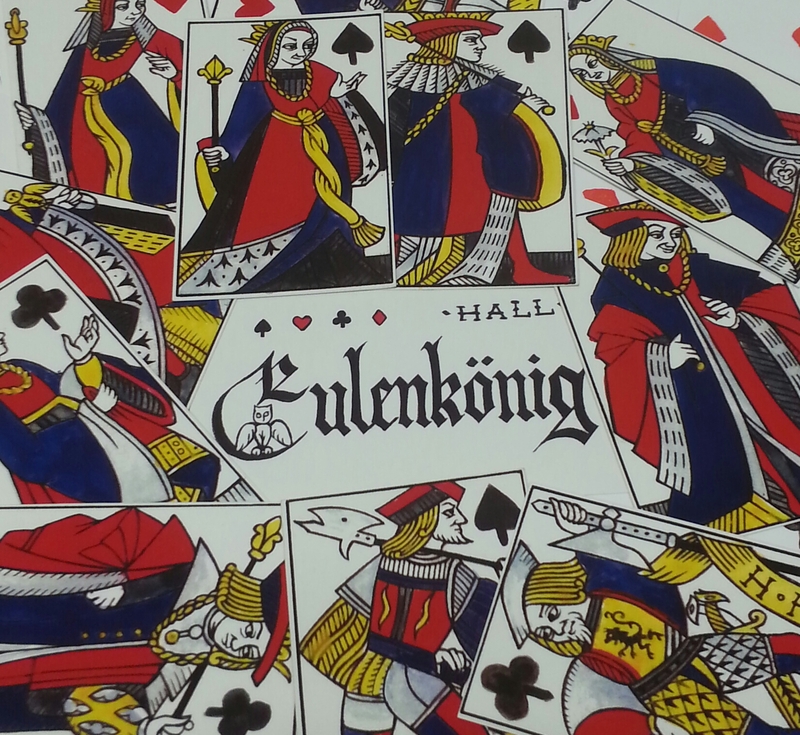 An Early Lyons “Eulenkonig” Cards, and the development of patterns. 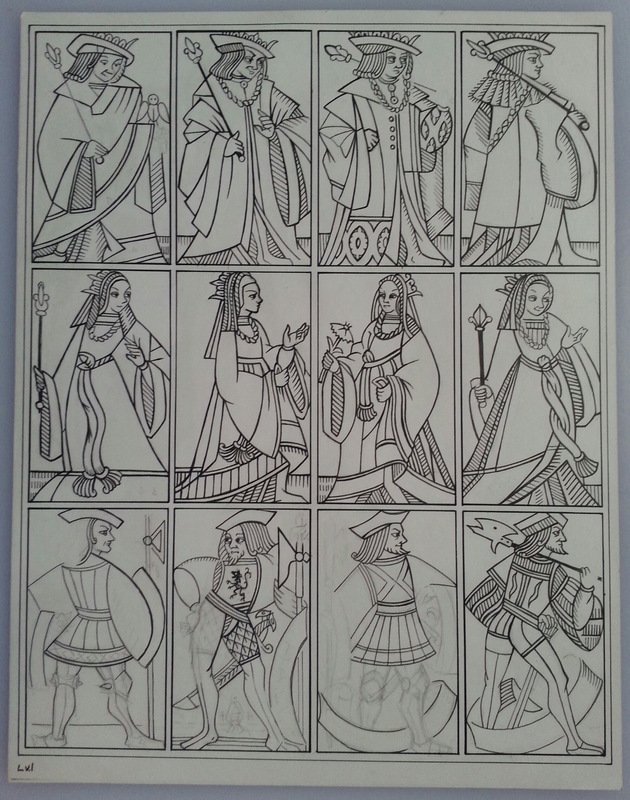 The late fifteenth century is when “patterns” begin to solidify in playing card manufacture. This is to say that the same designs appear on more than one manufacturer’s cards, often from the sale or inheritance of equipment. In later centuries, some countries made these patterns law, allowing for easy identification from tax authorities. Today the tax stamp is obsolete, but some of the patterns remain. 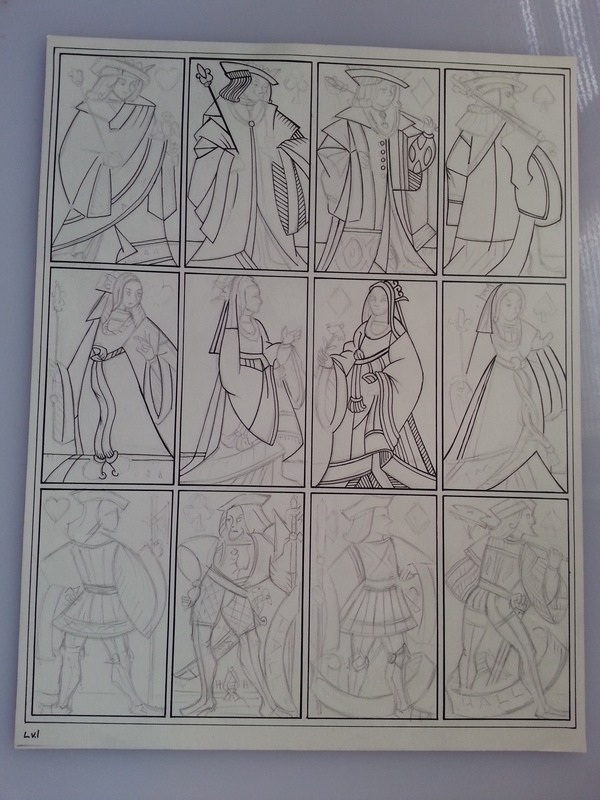 Sometime in the first half of the fifteenth century card makers in Southeastern France developed a cost-saving step; only the court cards were xylographed, while the rest of the pack was completed with colored stencils only. These affordable cards were exported far and wide, and many countries credit this French ancestry for their modern patterns. An example of this is what is now called the Anglo-American pattern, which developed in Rouen, in Northern France. 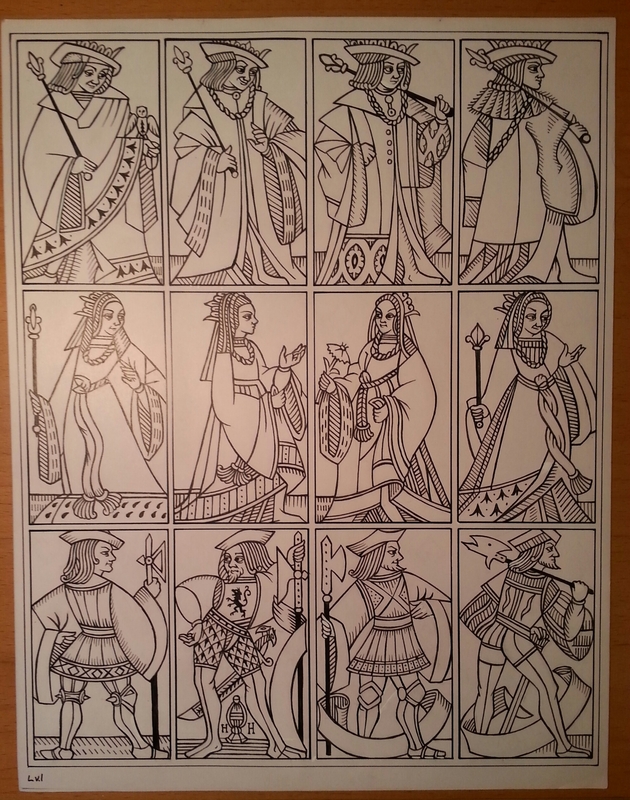 Early examples of the pattern appear in the mid sixteenth century, but many of the court figures (such as the ‘suicide king’) appear in the late 14oos. 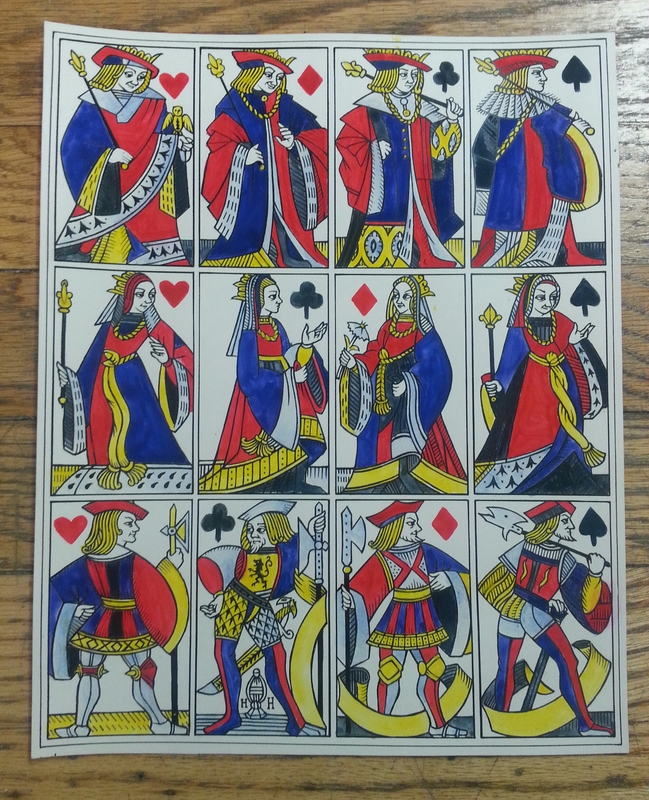 The cards represented here are from a pattern made in Lyons, and known examples go as far back (possibly) as 1491. It was one manufactured for export to Western Switzerland. I have labeled mine “Eulenkonig” for the king with the owl, to separate it from all the other early Lyons packs. These card makers were busy and abundant! I will continue to update as this project progresses. It is under consideration for a xylographed version. The valets are moving the slowest, simply because I have the least amount of information about them. 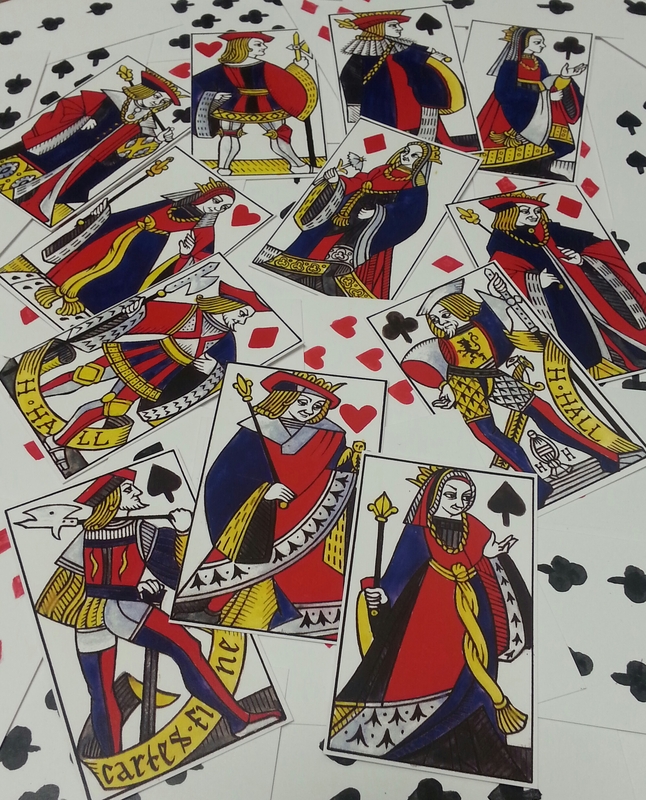 I have largely been using Henry Rene D’Allemagne’s Les Cartes A Jouer, published in 1906 (a highly edited collection from this book was published in 1996, and does not contain these patterns). Although a dated source, it’s very comprehensive, and I am able to fill in the valets of hearts and diamonds with it. As this is a pattern, certain elements of each image will be passed to their descendants, often passed to other patterns. For example, the Valet de carreaux can also be found in the patterns from Guyenne, Burgundy, and Languedoc. Although he appears in these areas earlier, France made these patterns law in 1701. They are printed on smooth bristol. Reblogged this on Bella NOLA.